Physical form Compacted salt: multiple tablets in each bag, easy to handle. Compacted salt: 2 x 4Kg bricks in each pack, easy to handle. 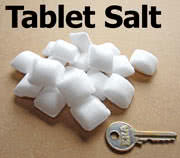 You can use block salt in a tablet salt water softener and you can use tablet salt in a block salt softener. 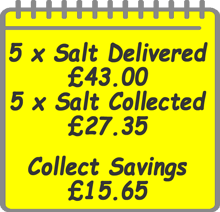 Tablet salt is consumed at the same rate, does exactly the same job in the water softener and costs a lot less than block salt. The real difference between the two types of salt is just marketing. We know, we sell them both at Ensign - The Water Softener Centre. We supply more tablet salt than block salt nowadays. Deliver my water softener salt here.